I wanted to do the Hellride this morning. I'm feeling strong and it just plain old makes me happy to play with that bunch. Repaying the hurt others have gifted me when I'm not quite so fast. However that wouldn't have been the best course of action before tomorrow's SSS, a race I want to do well at. 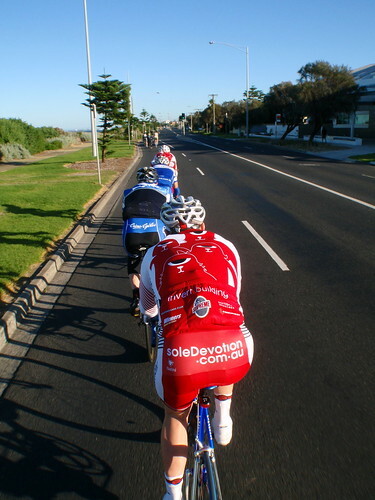 So, off to meet Mal, JJ and Carson for a roll to Mordi and back. Two up on the way down with a couple of Km ramp up for giggles, though it was the way back that was where the fun really happened. Ok, I know I should have been behaving, I'd settled on this ride specifically to take it easier, but that went out the window when we mixed in with another bunch that contained several distinct groups of shop riders. The pace steadily increased until we were all single file, attacks and counter attacks, gaps and covering moves. Jolly good fun.